AUD/USD breaks above key long-term trendline. Outlook for China improves supporting AUD. Australian property market decline offset by robust labour market. The AUD/USD is trading at 0.7166 at the time of writing, on Friday, April 12; it is about half a percent higher this week. I see the balance of probabilities tilted to the Australian Dollar (UAUD) continuing to rise over the medium-term, for a number of reasons: the first being the strong labour market, the second a probable improvement in the Chinese economy, and the third technical chart developments. Much of this week’s gains can be put down to comments from one of its central banker’s, Reserve Bank of Australia (RBA) deputy governor, Dr. Guy Debelle, who said the consensus view of the economy was overly pessimistic and the Bank probably wouldn't be cutting interest rates any time soon. This flew in the face of market expectations that the next move by the central bank would be to cut interest rates, and as a consequence led to a recovery in the Aussie. The RBA’s main concern was the lack of inflation - a sign of stunted growth - and also more specifically the rapid fall in property prices, particularly in large urban areas. From the RBA’s perspective the fall in property prices was concerning because it reduces wealth, but also because of the impact of negative equity (where the value of the home falls to below the value of the mortgage). The hit to construction jobs was another related market concern. Ultimately, RBA’s Debelle did not see a high systemic risk from the worst of these ills - negative equity - however, unless homeowners were forced to sell their properties and realise the debt. Yet this seemed unlikely because of the aid of the buoyant labour market which meant homeowners could usually find work pay their mortgage, thus limiting repossessions. So far in the two states most hit by negative equity the unwind of the property market bubble had actually occurred in a fairly orderly fashion, according to Develle, precisely because people were able to find work. Overall the strong labour market makes a recession driven by a property crash unlikely, at this stage, and is the first reason for my positive outlook for the Australian Dollar. Many describe the Australian Dollar as a proxy for China because it is so sensitive to Chinese data. The roots of this interrelationship lie in the close trade ties between the two nations. China imports high quantities of Australian raw materials such as iron ore, aluminium and coal. No analysis of the Aussie, therefore, would be complete without an analysis of China too. One factor which has driven the decline in the Aussie in the last year and a half has been the slowdown in China caused by the trade war with the U.S. This has cost both countries billions in lost trade but it especially affected China which exports much more to the U.S. than vice versa. The good news for the Aussie, however, is that the outlook for trade relations between China and the U.S is probably set to improve rather than worsen. The two countries are in the middle of trade talks but the outcome is likely to be an agreement and an end to, or easing of, tariffs. The logic is simple: both superpowers rely too heavily on each other to want to continue an expensive trade war which is hurting both their economies. Both sides have strong motives to come to an accord. In China the imposition of tariffs has had a marked impact on growth at a time when it was arguably already coming down from a cycle peak. For Trump, meanwhile, the presidential elections may be an incentive to agree a compromise since the Chinese have focused their retaliatory efforts on hurting his voter heartlands, such as the soya-bean growing states of Iowa and Illinois, where they slapped the largest tariffs. A trade deal which eradicated tariffs, or at least put in place a timeline for lifting them would have a very positive effect on the outlook for both the U.S. and Chinese economies, and by default also the Australian economy and Aussie Dollar. It is not just the outlook for trade relations which is looking up but also the outlook for the Chinese economy as a whole which is improving and thus adds a ballast to my long Aussie Dollar call. One leading indicator for Chinese growth is metal prices. When metal prices turn higher or lower the economy usually follows suit. Metal prices at the moment appear to have bottomed and rebounded strongly and the economy is therefore likely to follow. Indeed, this may already be happening, as recent PMI manufacturing data for March, from both Caixin and official statistics, attest. Both recovered strongly to the upside and are now back above the 50 line which distinguishes between growth and contraction. When compared to the London Metal Exchange (LME) index of prices we see how the decline in PMI’s which was out of sync with metal prices was merely a ‘temporary undershoot’, before the recent rebound. The rebound adds to the picture of a moderate recovery, as has been signalled in metal markets for some time. 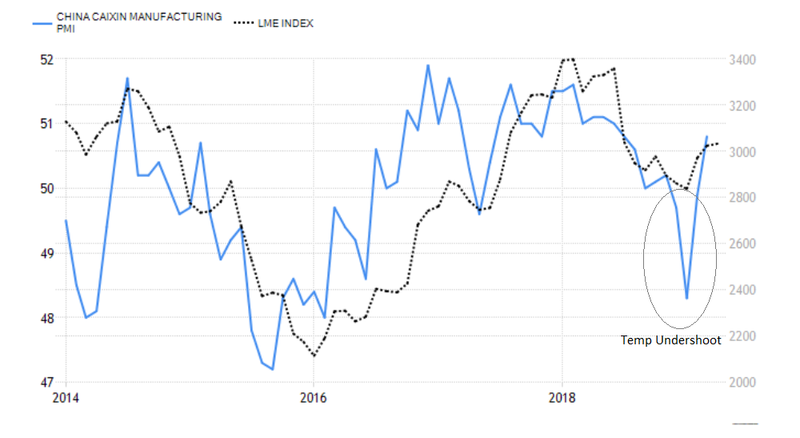 The details of the PMI surveys were also positive, as new orders and export orders moved higher, and these tend to be leading sub-indicator for the index in themselves. Trade data also showed an unexpected recovery in March with the Chinese trade surplus rising to $32.6bn in March from $4.1bn in February. This beat forecasts of $7.5bn by a mile. Another positive sign for China is that the Chinese stock market has recovered strongly in 2019. It is now 35% up on the year, and doing better than the U.S. stock market - a far cry from the situation in the summer of 2018 when Trump boasted about U.S. outperformance in a tweet in August. It could even be argued that the trade war may have unintentionally acted as a catalyst to the Chinese authorities’ express desire to make the Chinese economy more consumption-based rather than trade-based. Since the trade war Chinese shoppers appear to be favouring home-brands more, as has reflected in the falling share of the iphone market attributable to Apple, as Chinese shoppers switch loyalties to their own iphone manufacturers. All in all, the evidence is building for a case that the Chinese downcycle is finally bottoming in Q1. “We believe the drivers are easing on a broad range of fronts: easing trade tensions, easing monetary policy, easing fiscal policy and easing of the downward pressure from the reduction in inventories that we believe companies undertook in Q4. When strong headwinds fade at the same time as stepping harder on the gas, the economy can move forward again. We believe this is happening in China,” says Danske’s Von Mehern. Another compelling sign the Australian Dollar could be undergoing a reversal of the dominant downtrend comes from price charts. The weekly time frame chart above, for example, shows AUD/USD breaking above a very important long-term trendline, for the first time, during this last week. This is an extremely important bullish sign for the pair and suggests the tide could be turning in favour of the Australian Dollar. 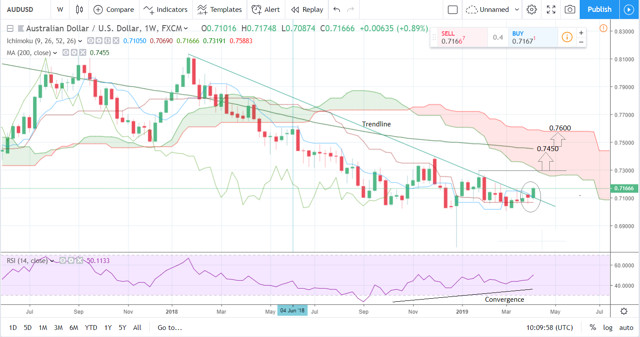 A further bullish sign is the RSI momentum indicator in the bottom pane which has been rising as the market has gone sideways since the start of 2019. The non-confirmation is called ‘convergence’ and is taken as a bullish indicator. We see a close above the trendline on weekly closing basis as a very positive sign. Further, a break above the 0.7300 late January highs, would provide a further layer of confirmation and suggest a continuation up to a target at 0.7450 and the 200-day MA, followed by 0.7600, at the top of the Ichimoku cloud.